In recent weeks, I have found a renewed interest in history and its narrative power to shape understanding, reorient one’s perspective, and build deep meaning. I will admit that this fascination finds its roots in the Hindu mythological narrative history I have been exploring since March (publication forthcoming… just be patient). As one can imagine, my interest in such topics has slowly waned over the intervening months. However, a renewed interest was sparked upon my reading of Destiny Disrupted: A History of the World through Islamic Eyes which turns a critical eye to the common narrative of world history that we in the West all share. In his book, Tamim Ansary tells the rich story of world history as the Islamic world saw it, from the time of the Prophet Mohammed (عليه السلام) to the fall of the Ottoman Empire and beyond. He clarifies why our civilizations grew up oblivious to each other, what happened when they intersected, and how the Islamic world was affected by its slow recognition that Europe—a place it long perceived as primitive and disorganized—had somehow hijacked destiny. History has a way of shaping itself. Its narrative retelling forms it, and with its formation, it becomes embodied by its people. The story we tell is indicative of the history we embody. 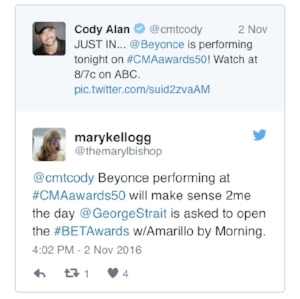 This point was brought sharply into focus this week after Beyonce’s performance at the Country Music Awards. Minutes after she took the stage, Twitter erupted with tweets of racist disapproval. One such example is this one by Mary Kellogg re-posted on thewrap.com. The narratives we tell ourselves, even in regards to the history of our music, are indicative of the history that we embody. Clearly, Miss Kellogg’s historical narrative has been privileged such that she misunderstands her orientation to the facts. For too long, the history of country music, as it exists in the United States, has largely been said to have begun in 1927 with Ralph Peer and while that history is accurate, it is more than 300 years removed from the actual beginnings of modern country music. As early as 1689 records indicate a pronounced fear around the use of the drum as a form of communication among enslaved Blacks in the United States. Sir Hans Sloane is credited with writing about “Negros” making use of drums “in their wars at home in Africa, it was thought too much inciting them to rebellion.” Amid this understanding, the drum was banned from use by slaves across America in their spirituals and ritual songs. Making a way where there was none, Blacks created drum-like alternatives out of the same wood and skin combination once used in the creation of their drums. These alternative instruments are widely known today as the tambourine, bones, banjo, and fiddle. Following emancipation, Blacks could begin utilizing instrumentation particular to the marching band; a style of music which become popularized throughout the later part of the 19th century. The early 20th century saw Blacks using these instruments – old and new – to experiment with form and improvisation. The Great Depression and the Dust Bowl aided in the dissemination of these and other regional forms of Roots music. Roots music as a category defined by musicologist covers many forms but is called Roots music because it served as the basis of music later developed in the United States, including Rock and Roll, Contemporary Folk music, Rhythm and Blues, and Jazz. The Country Music Museum tells of the birth of country music as situated within the Appalachian Mountains of East Tennessee, specifically the town of Bristol. In 1927, Ralph Peer of Victor Records traveled to Bristol in search of a unique local sound. In that same year, two local acts signed contracts. 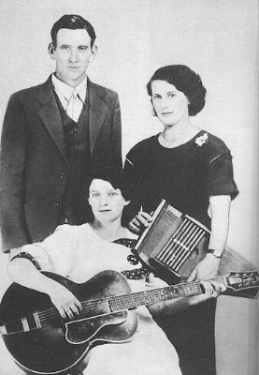 The Carter Family from Virginia and former railroad worker Jimmie Rodgers became the founding members of American Country music. The instruments in their hands: guitar, autoharp, fiddle, and bass. History has a way of shaping itself. Its narrative retelling forms it, and with its formation, it becomes embodied by its people. The story we tell is indicative of the history we embody.